HomeBlogtrivago Express Booking, Book on Google and TripAdvisor Instant Booking: what are the similarities and differences? Improving the user experience and, therefore, increasing conversion by eliminating any possible loss (clients who don’t convert), which happens when they go to the OTA or hotel website. Can I connect my direct sales? Yes, through a partner who has the required integration. Is it a space reserved exclusively to the direct channel? No. OTAs also have access. How much does it cost? Is it CPC or CPA? Instant Booking only offers a CPA (commission) model in two formats: 12% (guarantees at least 25% of visibility), or 15% (guarantees at least 50% of visibility). Book on Google does not incur any additional cost, although in order to activate it you need an active campaign on Google Hotel Ads, which does have a cost in its CPC (cost-per-click) or CPA (cost per action or commission) models, which range from 10% to 50% (depending on your choice). 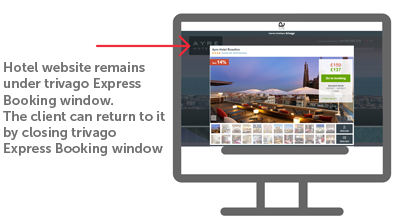 trivago Express Booking also doesn’t incur any extra cost, although in order to activate it you need an active campaign on trivago, which does have a CPC-based cost (cost-per-click). If I don’t participate with my channel, will the OTAs? Since there is a single entry on Book on TripAdvisor, if you don’t participate, the OTAs will, with the most aggressive ones being Booking.com and, more recently after its integration, Expedia. On Book on Google and trivago Express Booking, it’s not an important issue. OTAs can use it regardless of what you do. Where is the booking made? Does the client know he is booking through the direct channel? TripAdvisor and Google highlight the collaboration with the channel which they connect to (OTA or hotel website) and they do so visibly yet with reduced importance. The client is aware of this collaboration but also that he is booking on TripAdvisor or Google. trivago, however, highlights the channel’s image much more by reducing the importance of its own brand, making the client feel that he is booking through the channel directly. In the case of OTAs and hotel chains, their logo stands out and in the case of hotels directly it states their name. Once the booking process has started, can the client go to the hotel website? Google and TripAdvisor: No. The client can only finish the booking on Book on Google or Instant Booking. trivago: Yes, the client can redirect to the hotel website and finish the booking there if he prefers. Who does the client belong to? The hotel or the metasearch engine? Google, trivago and TripAdvisor all facilitate bookings and provide the hotel with the client’s details. However, the processing of these details is different. While TripAdvisor and Google also keep them, trivago deletes them once they have been passed on to the hotel (unless the client expressly accepts otherwise). Therefore, you could say that the client belongs to both in the cases of Instant Booking and Book on Google but only to the hotel in the case of trivago Express Booking (unless the client also accepts to have his details stored with trivago, which would then make him their client as well). Who sends the booking confirmation to the client? The channel, always. If it’s your direct sale, the client will receive a booking confirmation from the direct channel. 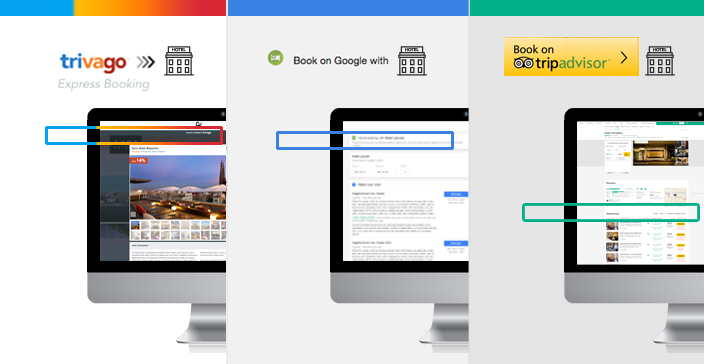 TripAdvisor and Google send a brief booking confirmation but less detailed than the one from the actual channel. trivago doesn’t send any emails in any case. Is it yet another channel in your channel mix? No. They facilitate the bookings of your existing channels, they are not a channel per se. Instant Booking: Yes, although with some nuances. Book on Google: No, although with some nuances. trivago: No. Out of the three, it is the one furthest from being an OTA. Try it, measure it and make a decision on whether to continue or not. Not participating without trying is a mistake. trivago Express Booking, Book on Google and TripAdvisor Instant Booking share the same objective (increase conversion and profitability of campaigns), but follow very different strategies. We could discuss for days which model is better and whether it’s good for the hotel or not. The reality is quite different and, once again, it confirms that direct sales, much to our displeasure, are getting more and more complicated every day. We must get used to coexisting with giants such as Google, trivago and TripAdvisor, but also learn how to use them intelligently, with the purpose of making more profit and reducing OTA dependence. The challenges are still where do OTAs hold on to in order to defend their model and being capable of improving profitability by moving sales from OTAs to the direct channel, despite the costs which derive from Google, trivago and TripAdvisor. At Mirai, we believe this is possible, but we also know that it’s not as simple as connecting your search engine and waiting for the bookings to come in. The key, once again, is to have the best technology, combine it with a good strategy and implement it wisely. Best technology ALWAYS follows the best people. First conclusion, get the best people first. Second conclusion, all three meta solutions mentioned in this write-up have a very low value proposition to the consumer and are very burdensome to the hotel operator. 10-20 booking options at basically the same price? What’s the value for the consumer? 3 “me-too” unchallenged giants that are simply redistributing booking revenue. Time for innovation that benefits consumers without adding burden to hotel operators. it will come. Hi Dan, I partially agree with you. Once the hotel controls its final price (rate parity in all of them), the value proposition of metas will be much less. However, that situation is still far for the majority of hotels in the world. Metas are not becoming pure OTA but are definitely competing with them. The “good news” for the hotel is that in metas they can still save some money and have access to the client information. The “bad news” is that selling directly is becoming even more expensive and complicated. It’s not an easy answer. Tripadvisor is moving on really fast and updates quite frequently its API (about to launch version 8 https://developer-tripadvisor.com/connectivity-solutions/instant-booking-api/support/) which includes quite a few cool features other metas do not have. Trivago has a lot of OTA connected (that means a lot of suplly) and its technology has improved a lot in last years. Google’s approach is very powerful but still slow in capturing volume (visits). However, their technology is very good, although still short in some functionality such as adults and kids rates and playing with searching for occupancies besides 2 people. To sum up, each meta is strong in some areas, but no meta is the best in all aspects. It’d be great to combine the best feature of each meta and create a super-meta! How do the OTAs react if the hotel posts a lower price on the metasearch than it offers to the OTA? With the various changes in EU and Swiss regulation concerning parity clauses is there a margin (% lower price) that the hotel can offer in metasearch without suffering retaliation from the OTAs?